Set-top box or STB in short is a consumer electronics product with which a TV is connected and it offers the user additional usages than direct cable line. Some types of Set-top Box also require a satellite receiver for proper function of the main unit. 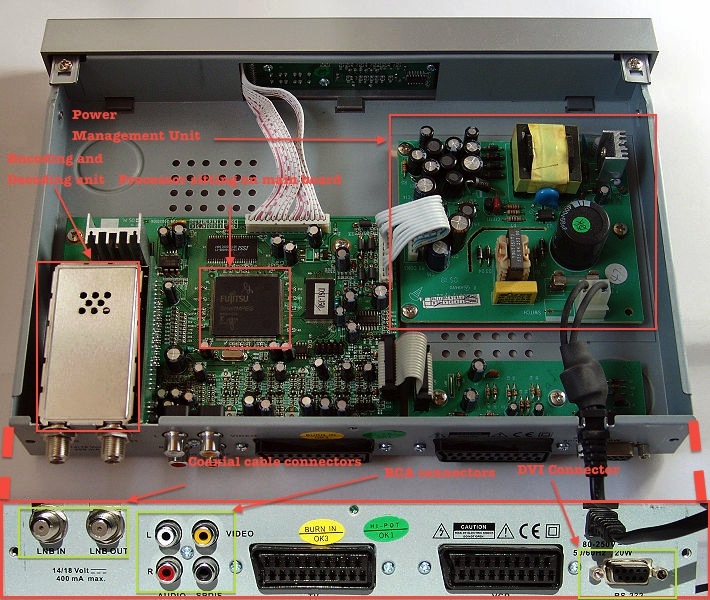 There are different types of interfaces in these Set-top Box models in order to connect to the television sets and additional Set-top Box recorders. Active : Provides the basic functions. The name active is actually a misnomer. Passive : Adds the capabilities of the basic Active unit, but that do not themselves provide new features. Bidirectional : Provides both active and passive functions like all types of recording options. Set-top Box can play media like DVD if they are interactive, the recording of received data varies widely (like satellite , internet etc.) or methods (digital, analog, encrypted or non encrypted). Nowadays there are TV models with integrated DVD drives, or DVB -receiver (s) so Set-top Box selection is an important point. Exotic Set-top Box receives data from weather stations and at least has basic Internet access option. And external advertising filter and home automation controls are usually provided. Image : Semi-Shattered image of a Set-top box, adapted from Wikimedia and modified by Dr. Abhishek Ghosh by labeling. Licensed under GNU GPL 2.0. There are different types of interfaces in order to connect to the television sets and Set-top Box. The classic universal method is to use a UHF modulator via a coaxial antenna cable. So there are analog connector and protocol as well as S-video option. Audio inputs and outputs are often through RCA jacks or running plugs. For digital image and data transfer, the industry relies on DVI, FireWire (IEEE 1394), Ethernet, HD-SDI and HDMI. For information on these connectors, please read our specific article on Audio and Video Connectors. This Article Has Been Shared 1162 Times! Install WordPress on Ubuntu or Debian PC is actually very easy. Its just running some commands from Terminal and here is full guide with Screen shots to help. Installing OpenPanel on localhost or actually your Ubuntu PC can be used for installation and management of various web softwares through a control panel. Cite this article as: Abhishek Ghosh, "Set-top Box : The Technology Behind," in The Customize Windows, December 5, 2012, April 26, 2019, https://thecustomizewindows.com/2012/12/set-top-box-the-technology-behind/.